These easy Baked Pumpkin Cardamom Donuts are tender and light and are filled with pumpkin puree and warm spices! Just what your fall morning cup of coffee or tea needs! These donuts have been a long time coming to the blog. I noticed awhile back that it’s almost been two years since I’ve shared a donut recipe! That’s not because we haven’t been making donuts, it’s just that we don’t make them that often. That, and I haven’t come across a really good one in awhile. I’m usually disappointed in the results of a lot of baked donuts. They’re usually too dry, too fluffy, or too bland. Not these. These baked pumpkin cardamom donuts came about because my husband had a cardamom donut and told me how good it was. I instantly thought about how I wanted to try to make my own, but make them with pumpkin. And make them baked. Because even though I don’t like a lot of baked donuts, I really don’t like many fried ones! Grease coating my mouth just isn’t my favorite. After making a few batches, we finally came across a recipe that was moist, light without being fluffy, and loaded with flavor! 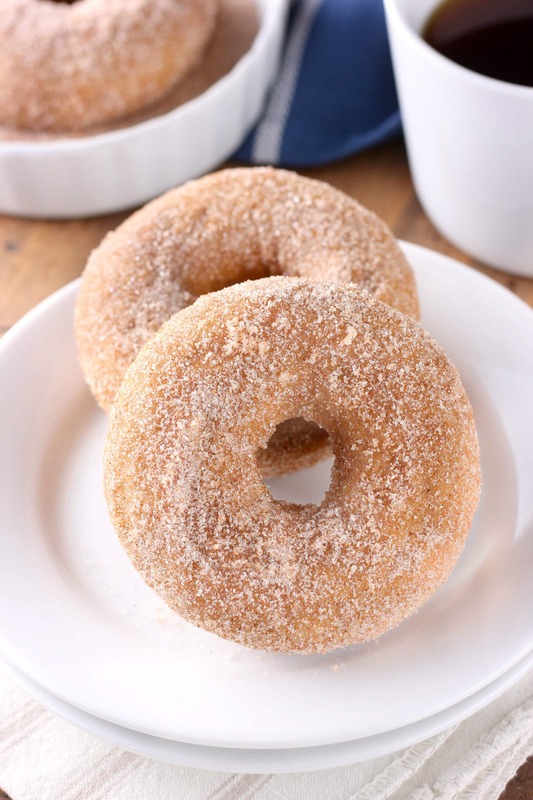 Pumpkin puree combines with cinnamon, nutmeg, and cardamom to create the base flavor of the donut. To give it more flavor and to make the cardamom flavor really shine through, we coated the donuts with a light cinnamon cardamom sugar mixture. Cardamom is one spice that I don’t use nearly enough. I always love the flavor, but it usually ends up hidden in most baked goods. Not these donuts! 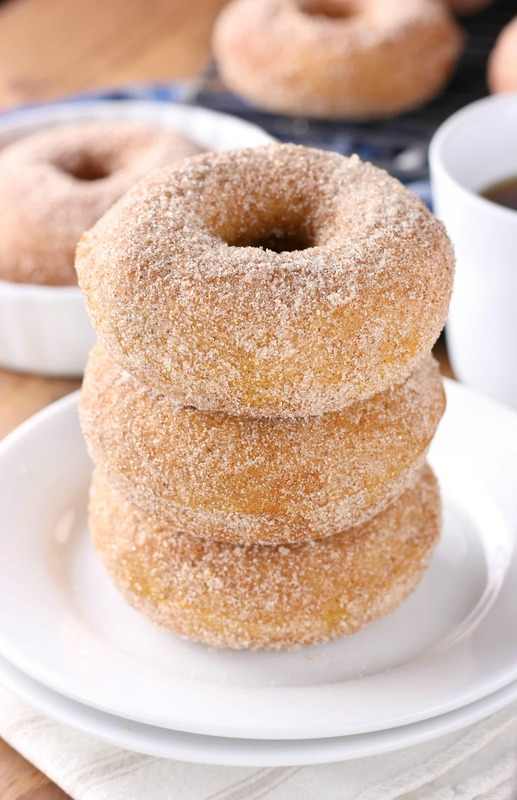 You’ll notice in the directions that you brush butter over the donuts instead of dipping them in the butter or using no butter at all before coating the donuts with a cinnamon and cardamom sugar mixture. 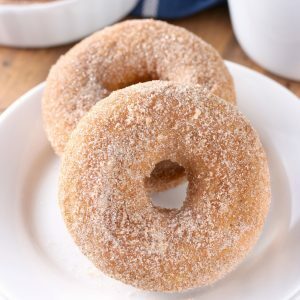 After trying a few different methods for getting the cinnamon cardamom sugar to stick to the donuts, my husband and I both decided that the donuts tasted the best with the butter brushed onto them. I placed them all on a wire rack and used a pastry brush to lightly brush butter on one side of all of them, then flipped them over and brushed the other sides. If the butter is warm, you should be able to do at least 6 donuts at a time before it starts to harden. If your house is warm or the butter is hot (be careful! ), you should have time to butter all of the donuts before it hardens too much for the sugar to stick. Make them for weekend brunch, make them for a fun morning breakfast, make them just because. Whatever your reason, your fall mornings will get tastier! In a large bowl, whisk together flour, sugars, baking powder, cinnamon, nutmeg, cardamom, and salt. Stir in milk, pumpkin, eggs, butter, and extracts until just combined. Pour batter into a pastry bag or a ziploc bag with the corner cut off. Fill each donut cavity about ¾ full. Bake for 10-12 minutes or until edges just start to turn light golden brown and donuts spring back when lightly pressed. Remove to a wire rack to cool for 2 minutes before removing from pan onto wire rack. Stir together sugar, cinnamon, and cardamom in a small bowl. Brush donuts with melted butter and dip donuts in sugar mixture until coated. Best eaten in 1-2 days. 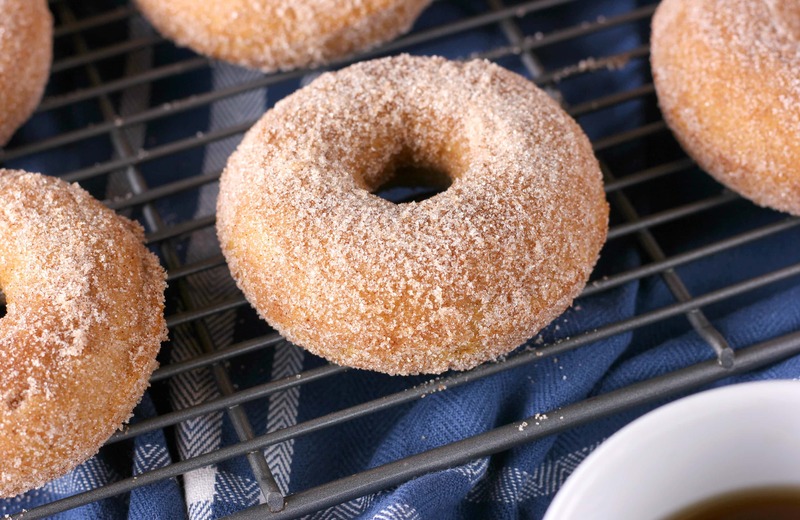 Pumpkin donuts are my absolute favorite and I’m loving the cardamom in here! I bet these smelled so good when baking. Looks perfect for breakfast! I’m never been a huge donut person but every now and then I enjoy a baked one! These look perfect for fall – I love that you used cardamom! Baked donuts can be so tricky but I’m glad these turned out so well for you! They look AMAZING — love that cinnamon sugar coating! I wait all year for pumpkin donuts because otherwise I’m not that interested in donuts. These look so good. And I am so so glad they are baked!! YUM! The texture looks perfect! Loving everything about these donuts! They look perfect! This is a great reminder because I haven’t made donuts in a long while either! I love that you made these whole wheat and the cardamom with pumpkin sounds so delicious! 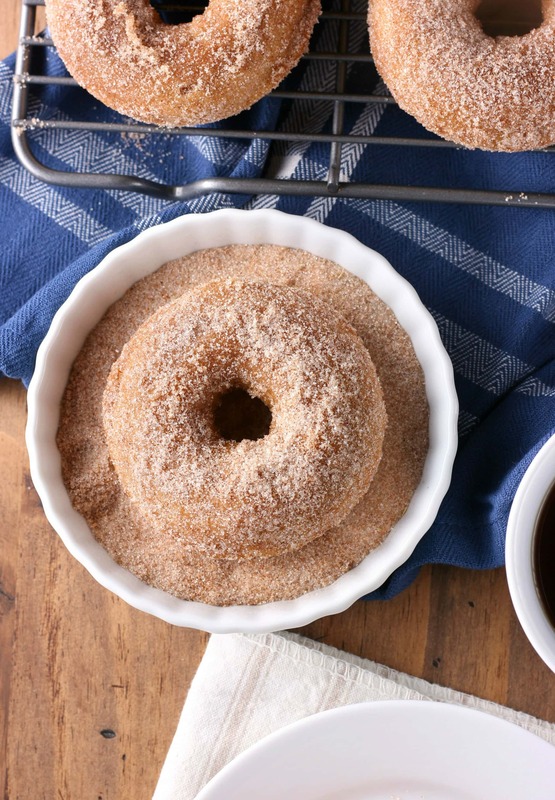 These baked donuts are a healthier option than the traditional fried donuts. Thanks for sharing!!! Fall ins’t complete without donuts! I will have to try making this recipe! I bought a donut pan a while back and have failed almost every donut recipe I’ve attempted. I really want to nail baked donuts!! Your recipe looks and sounds amazing, so I’m going to try making donuts again. Wish me luck! Can these be made with ap flour instead of wheat?